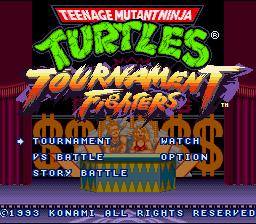 ABOUT: Teenage Mutant Ninja Turtles: Tournament Fighters is the title of three different fighting games made by Konami, released for the Nintendo Entertainment System, Super Nintendo, and Mega Drive/Genesis between 1993 and 1994. Each title is distinctive and different on its respective platform, featuring different characters, gameplay mechanics, graphics, and storylines. 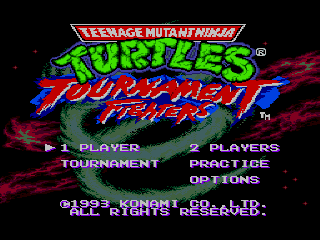 The trio of games is known as Teenage Mutant Hero Turtles: Tournament Fighters in Europe. 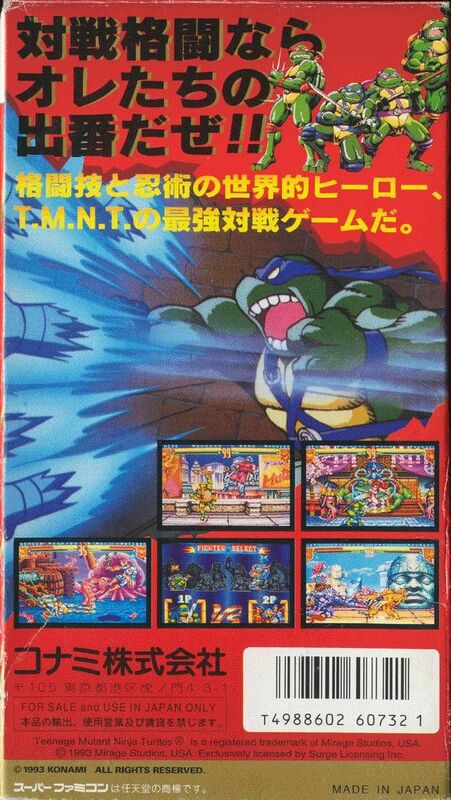 The Japanese SNES release is called Teenage Mutant Ninja Turtles: Mutant Warriors. Those original Nintendo graphics... Humble times. 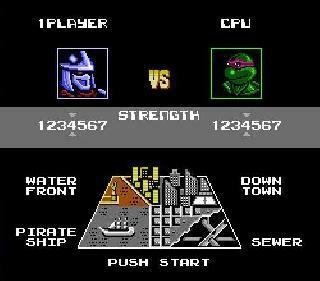 Nintendo Entertainment System version: In the single-player Story mode, players choose one of the four turtles (Leonardo, Raphael, Michaelangelo, and Donatello), as they hold a contest amongst themselves to see who is fit to take on Shredder's challenge. 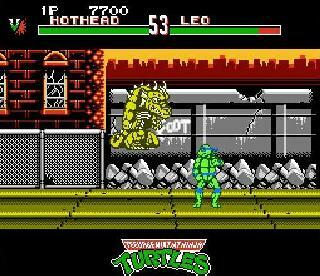 After defeating the first 3 opponents, the player proceeds to fight Casey Jones and then Hothead (a character based on the Dragon Warrior from the Teenage Mutant Ninja Turtles Adventures comics and the action figure of the same name) before the final match with the Shredder. 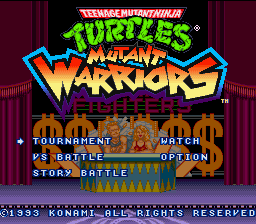 In addition to the Story mode, the game also has two Versus modes (one against the CPU and another against a second player), as well as a four-player tournament mode. An option mode where the player can adjust the game's difficulty, continues, and speed is also available. Battles consist of 3-round matches and the first player to win 2 rounds is the victor. 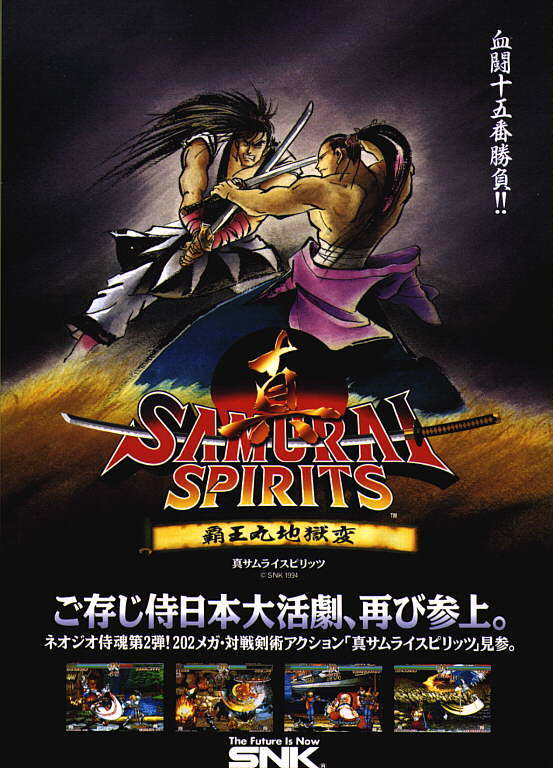 Each character has their own repertoire of basic punch and kick techniques, as well as command-based special moves. 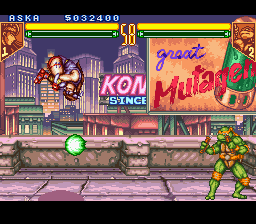 During battle, a flying monitor with Splinter's face will sometime appear that will drop a red ball power-up at the middle of the stage that can be retrieved by either fighter. Whoever retrieves the ball power-up will be able to use it by inputting the appropriate command. The NES version allows the player to match any character against a "clone" of himself, with the exception of Hothead. The game doesn't allow such a match under normal circumstances, but there's a way to bypass this restriction in the game's "Vs. CPU" mode. The second Hothead will be colored differently, as with all same character matches in the game, but the graphics will flicker due to the large size of both character sprites. 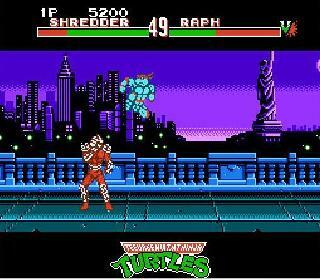 NES Version Story: The turtles have been challenged by Shredder, but before they fight him they decide to have a tournament between themselves to see who is ready for the encounter. 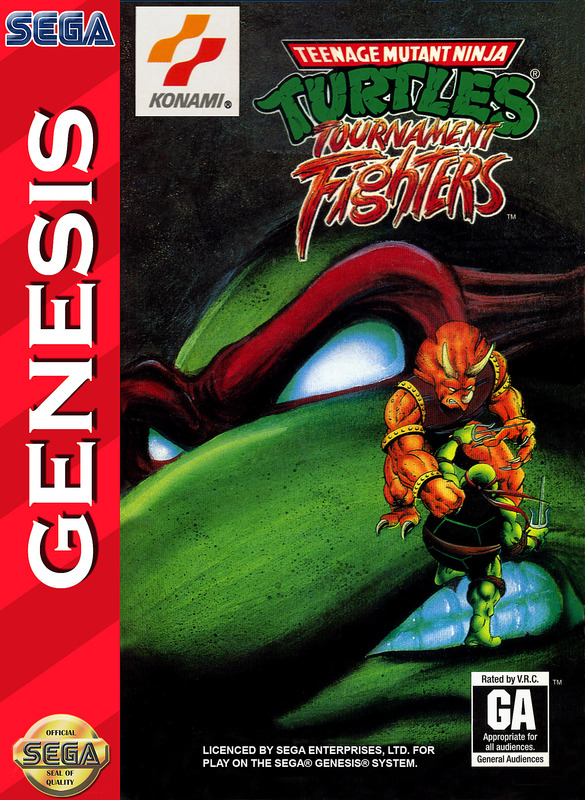 Fun Fact: The NES version of Tournament Fighters was the final game Konami released for the platform in North America and the PAL region in 1994. 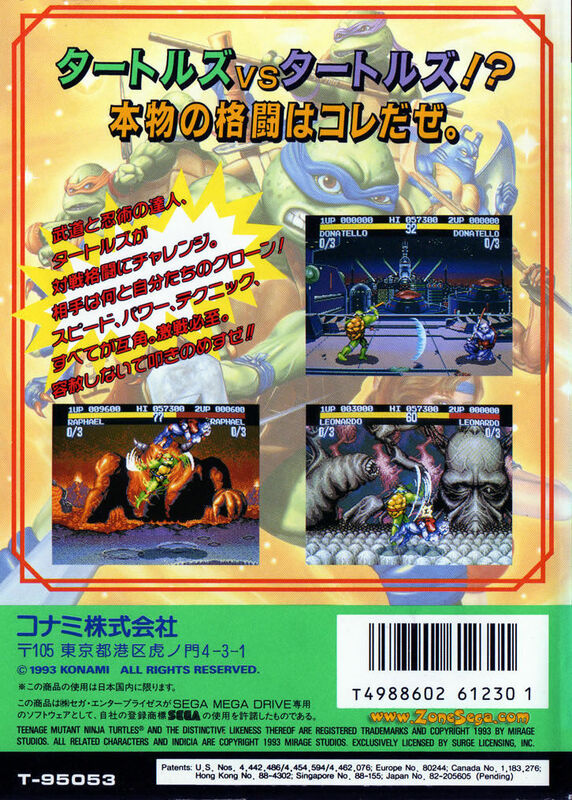 Unlike the other versions of Tournament Fighters, it was not released in Japan. 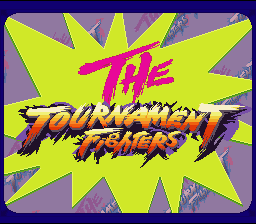 Tournament Fighters was one of the few fighting games released for the NES during the fighting game boom. 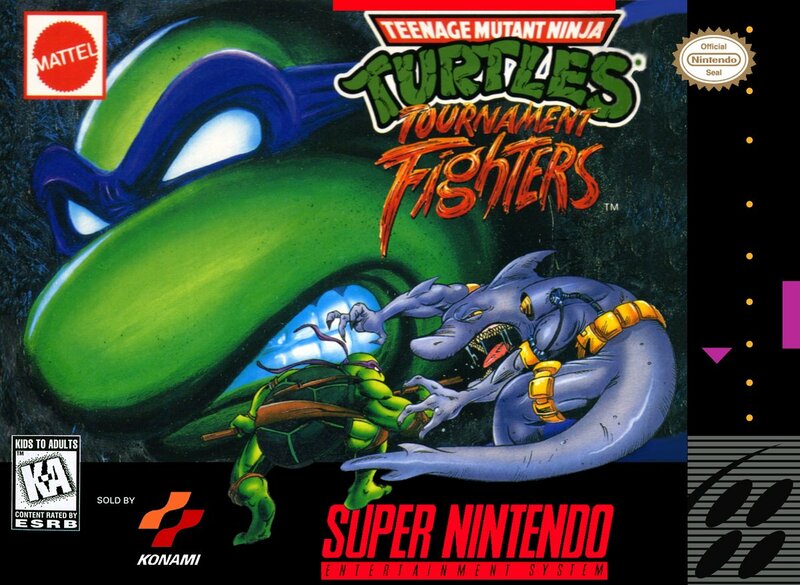 Not a bad looking SNES fighting game... but certainly not the best. 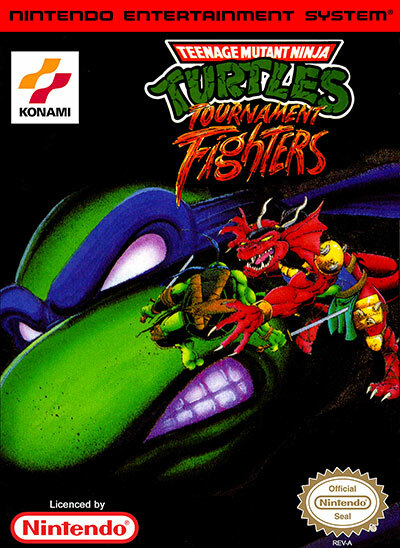 Super Nintendo version: This version is sometimes sold under the title Teenage Mutant Ninja Turtles V: Tournament Fighters in order to continue the numbering from the earlier Turtles games released on the Nintendo Entertainment System as well as the Super NES, and is often considered by fans as the last game in the original Teenage Mutant Ninja Turtles series. This game's controls uses a four-button scheme (two punches and two kicks, weak and strong). A particular feature is the possibility to use a super special attack. 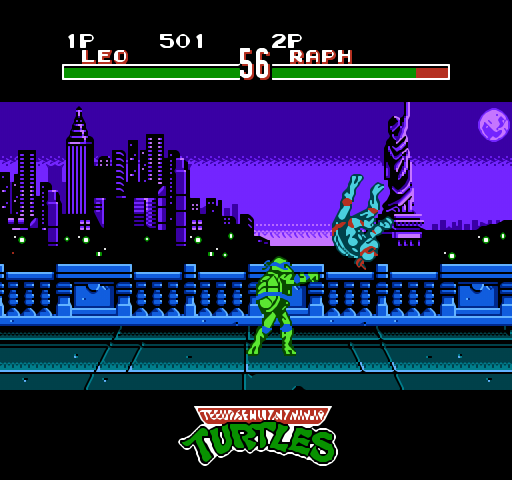 In order to achieve this, the player must fill a green bar under the life bar, by hitting their opponents. 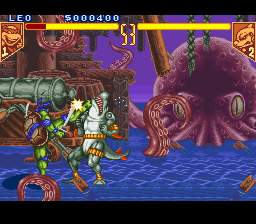 Once full, the player must press the two strong attack buttons simultaneously. There is also the option of enhancing the speed of the game, making the fights more intense but also harder to follow. 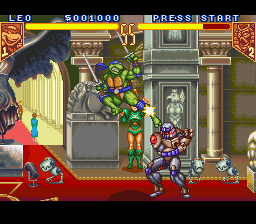 In addition to the main and versus modes, there is a story mode in which the Turtles must rescue April O'Neil and Splinter from Shredder's clutches. 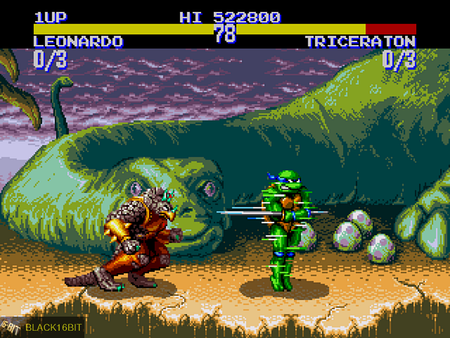 The Turtles must travel across the US in their Turtle Blimp, defeating other fighters and collecting information. 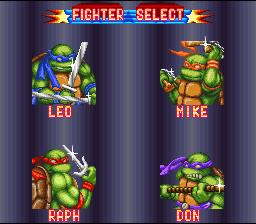 Only the four of them can be playable whereas the other characters (as well as a turtle clone) are the opponents. There is no Mutagen Meter in story mode. There is also a watch mode, which features computer controlled characters. 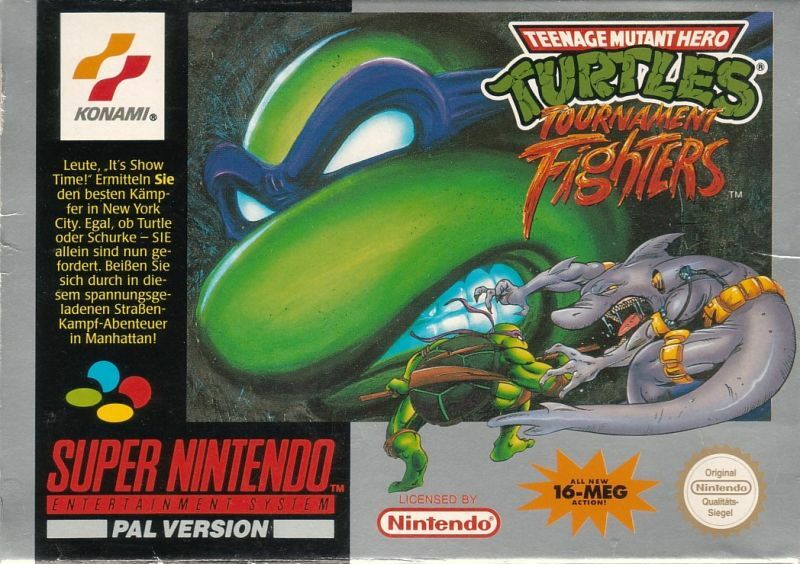 The Super NES version of Tournament Fighters was released in Japan under the different title of Teenage Mutant Ninja Turtles: Mutant Warriors. There are also some major differences in the Japanese version. 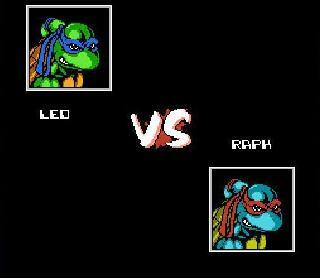 To list a few things: Some of character portraits are drawn differently in the Japanese release (such as Donatello's, Karai's and Wingnut's). 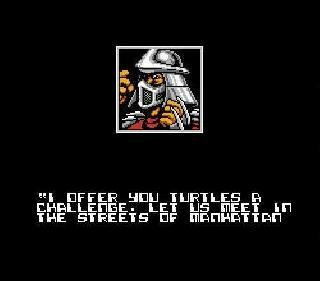 The voice of the announcer, as well as the four Turtles, are different. 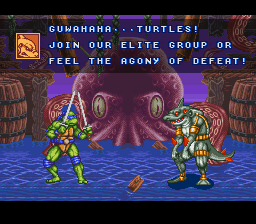 The voices of the Turtles in the Japanese version sound less rough, with attack names sounding more clear. 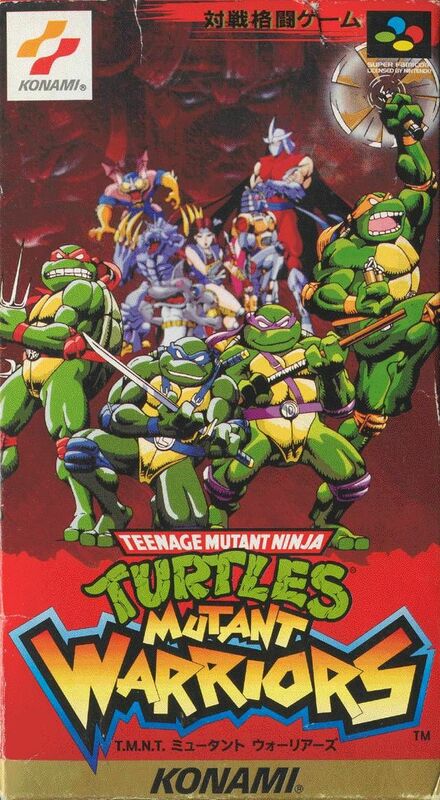 Some voice clips were taken from the Arcade version of Teenage Mutant Ninja Turtles: Turtles in Time. In story mode the Turtle Blimp actually displays the logo and the background is day time. You can select a character's 2nd player palette by pressing the Start button on the character select screen. Some of the character special attacks have been tweaked, such as Aska's double-hitting uppercut. 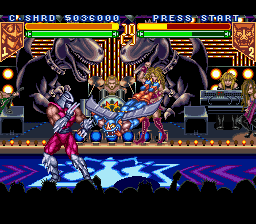 In Rat King's stage (Studio 6), the fighters can break the walls and expand the arena. Aska's sprites underwent several modifications in the Japanese version as well. Aska's leotard is in the form of a thong, exposing her rear when she does a spin or a high kick. In the overseas versions, they were originally bloomers. Moreover, her victory animation and pose is different. In the overseas version, Aska stands with arms crossed while butterflies surround her (an animation recycled from one of her special moves). In the Japanese version, she raises her arm in victory (while her breasts bounce). 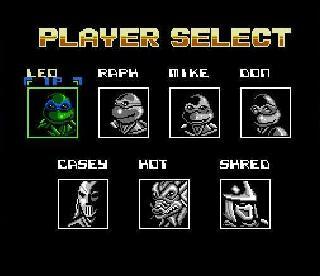 SNES version story: A tournament has been organized and fighters from all over have entered, Shredder of course being one of them. 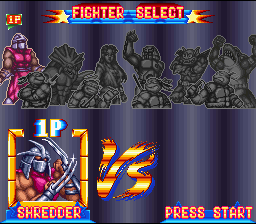 The turtles decide to enter the tournament in order to stop Shredder and prove their strength in battle. 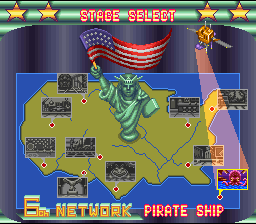 One of the unique features of the SNES version was the different turbo speeds. At the highest setting, this game was faster than Street Fighter II Turbo at the highest setting. Clone Don is all business... Look at that dude. Genesis / Mega Drive version: This version was released in North America, the PAL region, and Japan around the same time as its SNES counterpart. 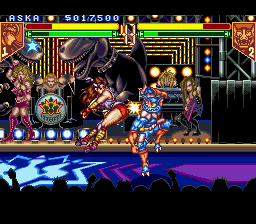 The Mega Drive/Genesis version uses the standard three-button controller, with only two buttons for attacking (punch and kick). To perform stronger punches or kicks, the player must hold the directional pad towards the opponent while pressing either attack buttons. The third button is used for taunting. Some of the stages in the game feature destroyable scenery that gives the player and their opponent access to new areas in the stage. As well as their special moves, each character has a 'killer' attack which is only accessible when they are close to death and the red part of the characters' life gauge at the top starts flashing. This is done by pressing the Taunt button in conjunction with a specific D-Pad motion. These moves nearly take out the other characters life gauge completely. 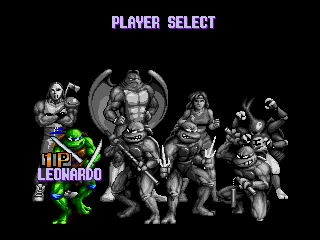 The game has 8 playable characters, which includes the four Turtles and Casey Jones, as well as April O'Neil (whose active role differs from the versions of the character featured in other games), Ray Fillet (a character from the Teenage Mutant Ninja Turtles Adventures comics), and Sisyphus (an original character, named Musha Beetle in the Japanese version). The player can adjust their power and speed after selecting their character. The music in this version was composed by renowned videogame composer Miki Higashino, in collaboration with Masanori Adachi. 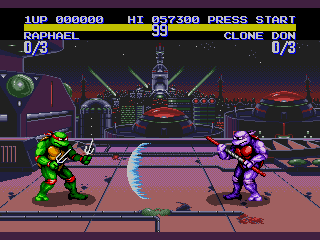 The main single player mode features the turtles and their allies traveling to various planets in Dimension X, fighting against clones of themselves, as they seek to rescue Splinter from Krang. 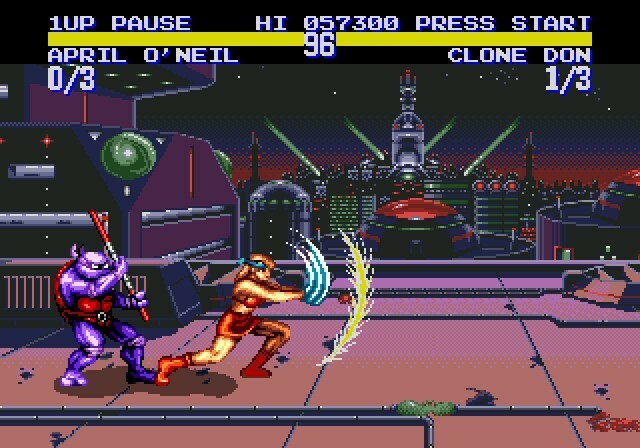 After defeating the eight clones, the player travel to the final three stages to fight against a Triceraton, Krang's Android, and Karai (in that order). 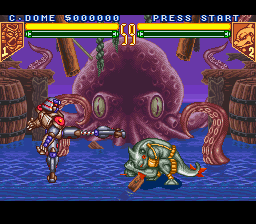 The game has a two player mode, as well as a practice mode in which the player faces the computer in a 1-round match, and a "Tournament" where the player must defeat 88 opponents with one life gauge. 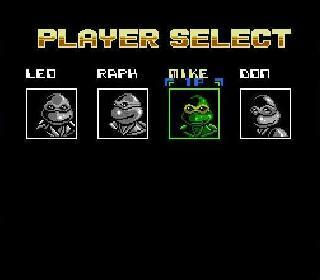 Genesis / Mega Drive version Story: Master Splinter is kidnapped by four purple turtles. 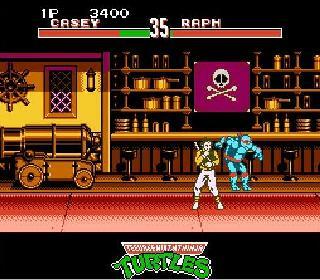 When the real turtles find out, Krang appears and tells the turtles that he has Splinter with him and that the only way to rescue him is to go to Dimension X and meet Krang. 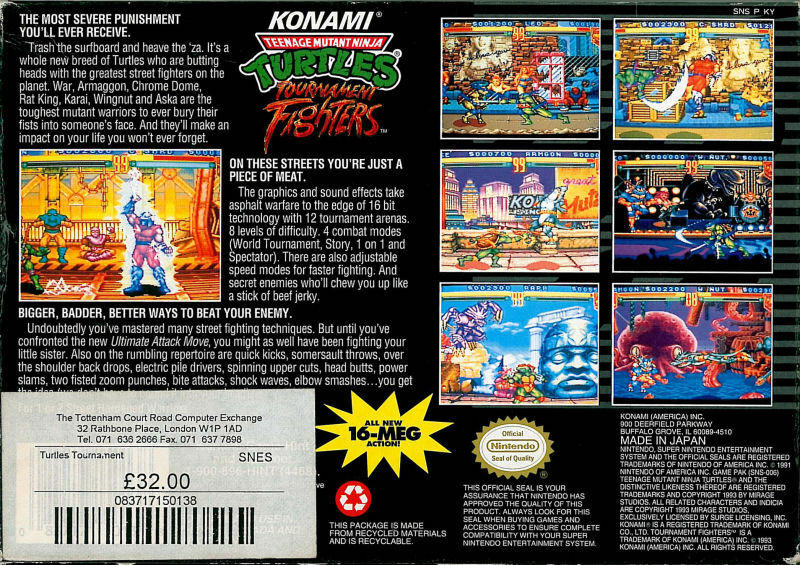 With the likes of Street Fighter and Mortal Kombat becoming headlining smash hits in the early 90's on both consoles and arcades, Konami wanted in on the fighting game action. 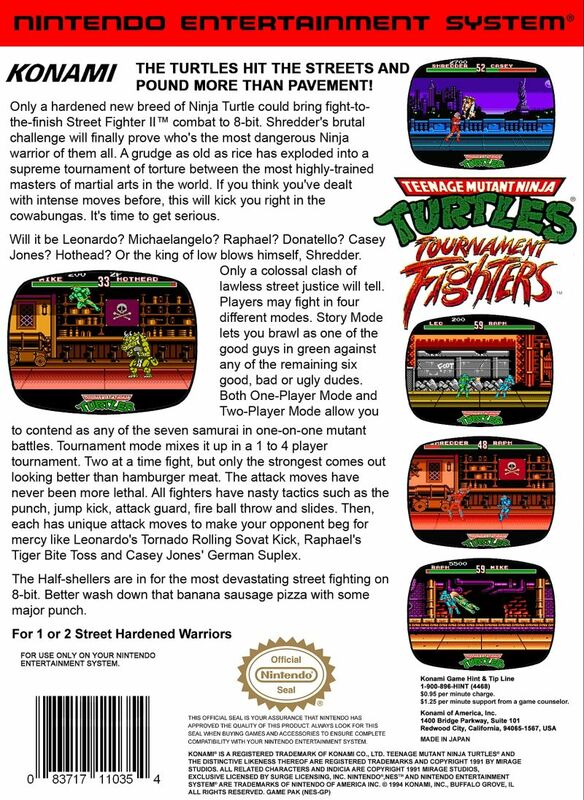 For a Teenage Mutant Ninja Turtles fighting game in the early 90's, Tournament Fighters wasn't a terrible effort. Quality-wise, the animation and graphics were a a bit behind the times... but one would have to be familiar with the current top fighting games of '93-'94 to really notice this. Personally, I don't have any strong opinions on this game, as I didn't play any of the 3 versions very much. I only played the SNES version a few times. 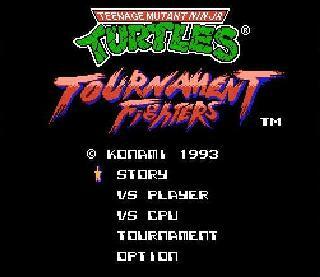 Honestly, I was so into Street Fighter, Mortal Kombat, and other arcade fighting games in 1993/1994... 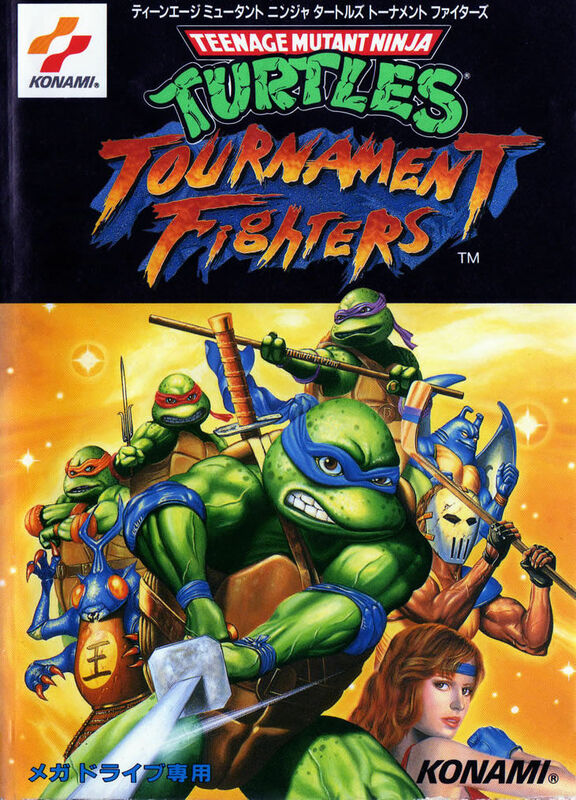 I didn't give TMNT: Tournament Fighters much of my time (or much of a chance). Just being honest. Perhaps I'll get around to doing a full review of one of the versions someday.